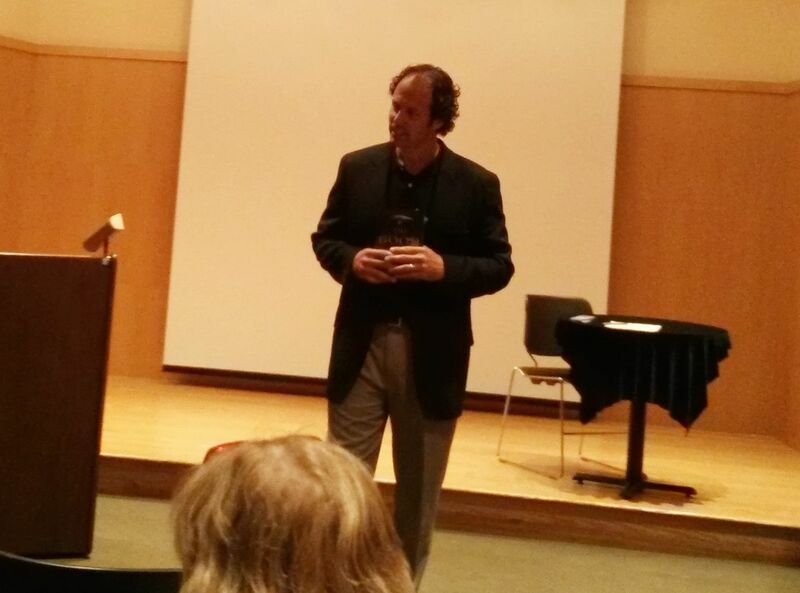 Went to see Brad Parks, author of the Carter Ross mysteries, at my local public library last night. Brad is a very funny guy, has a mellifluous singing voice, and charmed the hell out of the room. Margot Sage-El from Watchung Booksellers was there as well, and I picked up a copy of Brad’s latest- THE GOOD COP. Brad being altogether too self-effacing, he calls this his first “real” novel. It’s the fourth in the Carter Ross series, which began with the hilarious and heartfelt FACES OF THE GONE, a book I loved. Not only for its honest yet loving picture of Newark and the surrounding suburbs, including my hometown of Nutley, but for how he juggles comedy and tragedy in a manner that feels a lot like real life, only more vivid. Faces and the two that followed are based on news stories Brad either covered or was intrigued by, such as a grisly quadruple execution killing that was his first story as a crime reporter, or the subprime mortgage scam, and so on. Brad didn’t think that was “real writing,” and like many writers, he is too hard on himself. While some stories do spring from the mind like Athena from Zeus’s skull, most are a gumbo of inspirations and experiences that we simmer until it makes a sort of sense. Unlike life, a story has to do that. So I’m eager to read The Good Cop, as I enjoyed the novel he considers “not made up.” The latest concerns illegal gun-running along I-95, the “Iron Pipeline,” so it is quite prescient as the nation argues over whether we can even talk about guns, and the policies of neighboring states that allow illegal firearms to flow to street gangs without a trace. Brad gave a great talk and sang a little of “As Time Goes By,” which was written by Montclair native Herman Hupfeld. Then we strode to a local pub and enjoyed Founder’s Centennial IPAs. Brad’s got good taste in suds, as well. We met up with friends from his tenure at the Star-Ledger, including mutual pal and sportswriter Steve Politi, and I fled before I was cajoled into karaoke. Brad sang that old Billy Vera and the Beaters tune so well I felt like I was back in 1987. Full of heart, like the man and his writing. If you don’t know Carter Ross, start with Faces of the Gone, or jump right into The Good Cop. You won’t regret it.